Double Your Offer for FREE! 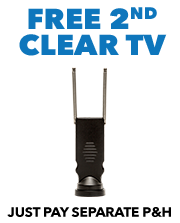 You can Double Your Offer and add a 2nd Clear TV Premium HD for FREE, just pay $7.99 to cover the P&H! Please select 'Yes Please' to upgrade to Double Your Offer!